Spring has officially sprung! I love that birds are singing early in the morning and the sun is out for most of the day now, I can even smell the warmth in the air teasing us with summer. It’s the time of year I want to clean my apartment, wash all my make up brushes (yeah I’m gross I should do it more often) and I start to pack away my winter wardrobe and get out my lighter clothes. As vegan fashion becomes more popular, the aesthetics will keep improving, making it easier for you to stay true to your style preferences without sacrificing your morals. These days there are so many great options for spring clothing, it’s just a case of checking the materials and making sure they’re free from animal products. Some fabrics to avoid, around spring especially, are silk (made by boiling silkworms alive), mohair (made from shearing angora goats) and of course leather. Instead, opt for Tencel, Lyocell, linen, organic cotton and hemp for lightweight, easy-to-wear fabrics. …but come on, this isn’t the average floral top now is it? It costs $148 but is a really versatile top that could be worn with shorts, trousers, jeans or skirts - worth it! 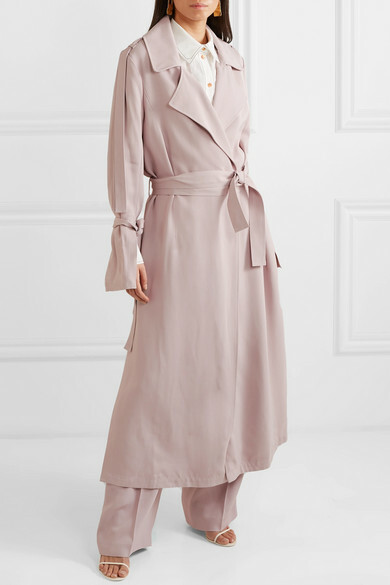 How gorgeous is this trench coat by OCHI - this has to be the ultimate goal for a spring coat? Made from viscose and only lined through the sleeves, this coat is incredibly lightweight and can be adjusted to suit your fit preferences. It looks great closed or worn open, something I always look for in a coat, and in this dreamy lavender colour I feel like it would work for both formal and casual styling. At £710 don’t expect to buy much food that month, but how often does this single-colour dreamcoat come along?? Another super cool piece by Komodo here, the Stella skirt in the circus colourway. I have emailed them to find out what the fabric is as it didn’t have a description (website error I believe) - but I’m pretty confident it’s vegan - will update if I find out otherwise. At £55 it’s an affordable skirt that can see you from spring right through to late summer and the pop of colour will bring life to all the outfits you could make with it. The stripes reminds me of deckchairs on the beach and the length makes it a more unique piece. A lovely tropical print top by Thought here, a nice alternative to the swarm of florals you’ll be facing. This is the Garabina Banana print top made from Tencel, a great material that is one of the most sustainable materials you can get. I love the fresh colours against the crisp white background on this, make it perfect to wear with white trousers or jeans. Only £49.90 and I can vouch for the top shelf quality of Thought clothing, so it will last you many spring seasons! After all this research I am even more excited for spring now! Bring on the blossoming flowers, sunny days and any excuse we can find to wear these clothes!